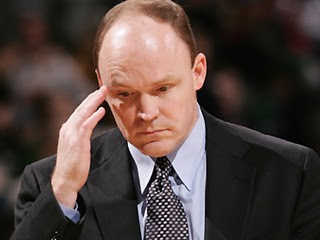 Skiles Puts His Foot Down ~ The Bucky Channel - The World of Sports from Wisconsin's Perspective. We have all had enough with how the Bucks are playing right now. I'm sure Scott Skiles must feel the same way, because he put his foot down to people who don't play hard. At halftime Monday night the Bucks were down 56-34. To start the third quarter Skiles went with Brandon Jennings, Ersan Ilyasova, Kurt Thomas, Luc Richard Mbah a Moute, and last but not least Jodie Meeks. For those who are saying whats wrong with that, well that leaves Bogut, Redd, and Delfino on the bench. And the bench is where they stayed. In the third quarter the Bucks did make a little run to cut the lead to 10 at one point. They could have cut it to 7, but Jennings missed a three point shot. After the miss the Bobcats ran down the court to get a 3 point play of their own. That would bring an end to the Bucks run, but it was nice to see the guys that cared try hard to come back from being down 22 at half. Skiles kept the Delfino, Bogut and Redd on the bench for the whole second half. One person who usually plays a lot of minutes finally got put in with 1:50 left in the game, only so Jennings could grab some rest. Who is this person you ask? Well, it's the one and only Charlie Bell. I am not sure if this means he is in the doghouse with Skiles, but when your only time in the second half is in the final 1:50 of the second half, that's like a kick to the nuts. Lets check out a few highlights from the 94-84 defeat. * Brandon Jennings only had 9 points in the first half, but really turned it around in the second. Jennings finished the game with 24 points and 7 assists. He really played hard in the first half, and you could see he wasn't happy about how the Bucks were playing. In the second half he really attacked the hoop, but just never got a call. Lets give him the Bucks POTG for his hard work for all four quarters. * Luc Richard Mbah a Moute played hard all four quarters too. He really worked hard on both ends. Luc is not a stud of a player, but he will always work hard every play. If only a few of the other guys had the heart that he has. * The Bucks were not hitting shots from downtown, but for some reason they kept taking them in the second quarter. They finished the game a dreadful 6-25 from beyond the arc. The Bucks could not just find their stroke, again. * Gerald Wallace was huge again for the Bobcats like he usually is. Wallace finished the game with 21 points and 14 rebounds. This guy is just an animal for this team. He earned himself the Hunter of the Night. * Flip Murray, a former Buck, had a nice night off the bench. He scored 16 points and had 6 rebounds, but his biggest stat was his +/- which was +22. * The Bucks are just not playing as a team right now. It seems that people are looking to shoot first and pass second. The games are not going to get any easier from here as they travel to face Orlando Wednesday night at 6:00 central. The other thing the Bucks need to stop right now is only scoring 10-14 points in a quarter. If this do this against Orlando, then the Magic will just destroy the Bucks. If you would like to waste some time check out the rest of the the stats from Mondays game via the link below.